The Guthrie Theater is opening their 2017-2018 season (my 15th season as a subscriber!) with Shakespeare's classic tale of star-crossed lovers Romeo and Juliet, and closing it with perhaps the most popular and successful Romeo and Juliet adaptation, West Side Story. 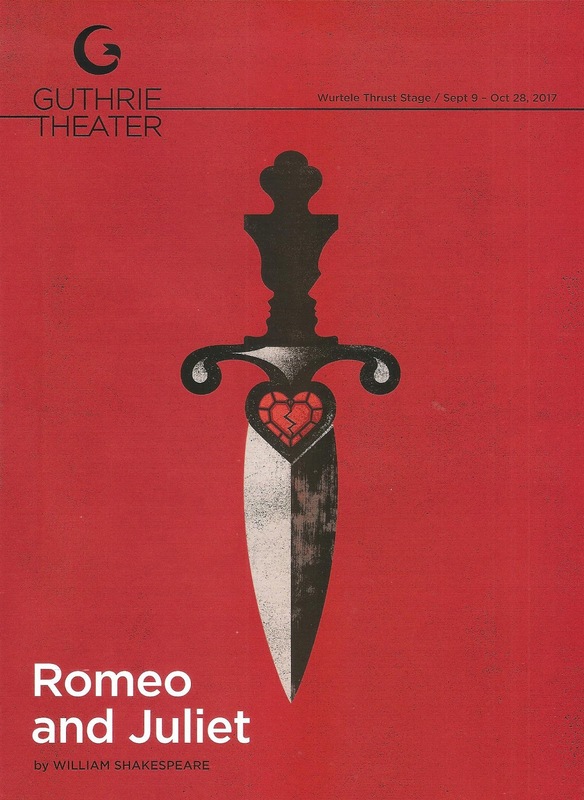 The last time the Guthrie did Romeo and Juliet was in the spring of 2004 (coincidentally my first season as a subscriber). I've seen it at least ten times now in some form or other (including earlier this summer), and not because I seek it out, but because it's done a lot. But despite (or maybe because) of the many viewings, I was still charmed, moved, and engaged by the Guthrie's new production of the classic. Because there's a reason that it's a classic, and this production, while familiar, feels fresh and modern, with an excellent cast of familiar faces and new, intriguing design, and interesting directing choices. A couple of non-locals make their Guthrie debuts as the title characters, and they completely won me over with their youthful charm, chemistry, and sure inhabitating of the familiar roles. Kate Eastman is a strong and spunky Juliet, a young woman who knows what she wants and goes after it. Ryan-James Hatanaka is as charming as a Disney prince, and if I were 25 years younger I'd have a new #theatercrush. Together they embody the brash, foolish, hopeless, and all-encompassing nature of young love. There are so many great people in this beautifully diverse cast, I'm not even sure where to begin! Including (but not limited to) John Catron making Paris not such a bad alternative to Romeo; Shá Cage and Andrew Weems as Juliet's parents; Candace Barrett Birk, a hoot as the Nurse; Corey Farrell stealing scenes as a Capulet servant in a no-small-parts kind of way; Lamar Jefferson with a delightful energy as Benvolio; the venerable James A. Williams as the Friar; and Kelsey Didion owning the role of Mercutio as if it were written for a woman. Interesting directing choices by Joseph Haj, now in his third season as the Guthrie's Artistic Director, include a twist on the balcony scene that has Juliet climbing, not Romeo; and the overlay of two second act scenes, one with Juliet and Nurse, one with Romeo and Friar, that nicely juxtaposes and parallels their post-banishment reactions. 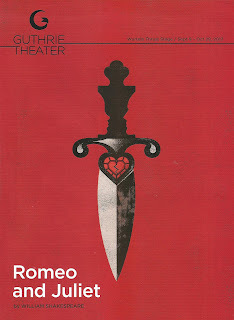 One of my favorite scenes is when Romeo is watching Juliet and talking to himself, trying to decide when to approach. Except that he's not talking to himself, he's talking to the audience, and even goes a few steps up the aisle and walks through the front row as they scurry to get out of the way. It's great to see them use that up-close-and-personal thrust space, looking at the audience and playing with them, bringing them into the story even more. It gives it a fun and informal feel that's probably a lot more like how theater was in Shakespeare's day. 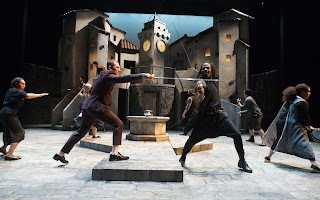 There is much sword and dagger play, and it's quite thrilling and action-packed (fight director Kara Wooten). pieces rotating around a center clock tower, stone city buildings on one side, turned to reveal the infamous balcony and Juliet's plush bedroom. It feels authentically like Renaissance era Italy, even if the costumes say otherwise (scenic design by Anna Louizos). Which brings me to the gorgeous costumes, modern with a touch of Renaissance. Classic suits for the men, dresses that could be seen walking down the street today, but with a few ruffled collars or long tunics that let us know we aren't quite in modern times. The black/gray/white color palette is simple, sharp, and elegant (costume design by Jennifer Moeller). And lots of tattoos giving the characters an edge. Great sound effects, including modern sounding music (sound design by Vincent Olivieri with composition by Victor Zupanc). This four hundred year old classic is very accessible, as the strong cast fills Shakespeare's words and rhythms (which can sometimes be tricky to follow) with meaning and relevance. The fresh and modern feel of the costumes, attitudes, and delivery also make it accessible, and it's long but not too long (two and a half hours or so). The first act almost feels like a romantic comedy, while the second act turns to hear-wrenching romantic tragedy. Romeo and Juliet continues through October 28 on the Guthrie's thrust stage. The last two plays we have seen at the Guthrie have been dreadful; Toni Morrison's "Blue Eyes" and King Lear. 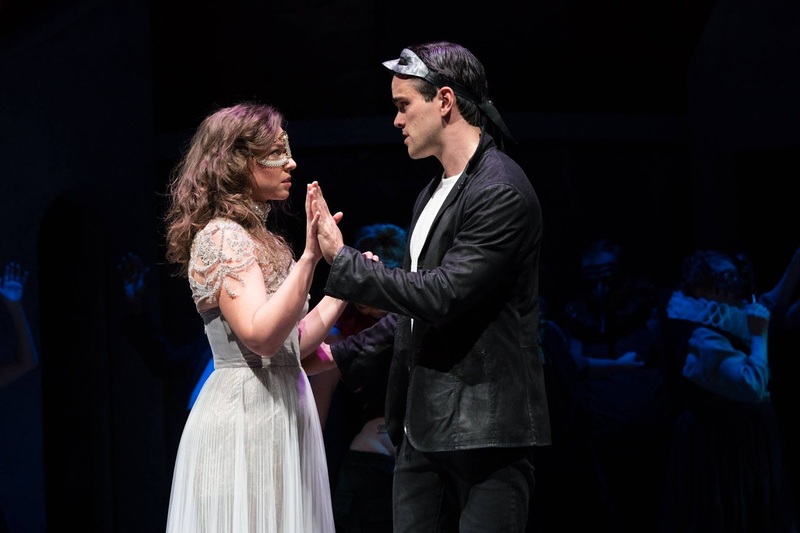 The ads we have seen on television, of two dancers in tee-shirts and this review, of actors in modern suits and dresses, with some ruffles, and "a twist on the balcony scene that has Juliet climbing, not Romeo", does not reassure us this Romeo and Juliet will be any different or better. Can some people who have seen this play tell us their opinions. I have the feeling we may be boycotting the Guthrie until Haj goes. Thanks for the comments Dann and NorseWind. Dann - you are certainly entitled to your opinion, and to spend your money accordingly. But I would like to point out that it's not uncommon for theaters to set Shakespeare in a different time than it was written, even the Guthrie in the Dowling era did this. It's still the same play, but it feels more accessible and relatable to everyone in the audience, as Shakepeare was meant to be. If you decide to go, I hope you keep an open mind to the possibility that just because something is different that what you expected, it's not always a bad thing. Thanks for your comment. While you are defending Haj's version of Romeo and Juliet, you didn't tell us if you actually saw either of these plays. If it were only King Lear, I might agree with you, but Toni Morrison's "The Bluest Eye" was also dreadful. Fool me once, shame on you, fool me twice shame on me. At the same time, we have seen excellent productions of Thurgood and Weisenthal at the Illusion. We will be following your advice and going to the Illusion, Pneumbra, The Jungle and Mixed Blood and giving The Guthrie a rest. These theaters are as good, or better than The Guthrie, at a fraction of the price. This is my 15th season as a Guthrie subscribers so I see everything. :) If you look to the right-hand side of this blog, you'll see a list of all 2017 Shows, including King Lear and Bluest Eye (which I thought was the opposite of dreadful, it was beautiful). All of the theaters you mentioned do great work too, hope you enjoy them! As much as I love the Guthrie, it is definitely not the only theater in town and I hope people experience all that #TCTheater has to offer! Dann, I agree with you totally. I'm not averse to seeing creative renditions that look and feel different, but then you gotta work a little harder to wow your audience. If I'm going to pay what my husband & I paid for tickets to this play, you better wow us. Esp. if you're the Guthrie. The Guthrie used to wow, but it is riding on past reputation in my opinion, and better do something soon because I and all my theatre pals have decided no more season tickets. There are so many other theatres in MSP, we feel it's time to see if one of them can make us feel passionate about going to plays again.